The Catholic Bishop of Awka Diocese, Anambra State, Most Rev. Paulinus Ezeokafor at the weekend warned politicians in Nigeria and the electorate indulging in vote selling and buying of its consequences, describing the act as a sin against good governance. Bishop Ezeokafor said the introduction of vote buying in the nation’s electoral process has dealt a great blow to the nation’s democracy and must not be allowed in 2019 general elections. He called on Nigerians to work for true national reconciliation and peace as the country goes into 2019 general election. Bishop Ezeokafor who spoke at Saint Patrick’s Cathedral, Awka, while delivering his Christmas message, told newsmen that vote buying is a “sin in the 11 commandment” and that those who indulge in it lack conscience and must go for confession. He stressed that it was the duty of the Church to preach against the vice and called on the electorate not to give in but insist on voting according to their conscience. The Catholic bishop of Awka said, rather than trade their votes and future for pittance, voters should endevour to vote for the right people to emerge so that the societal yearnings could be sincerely addressed. “We must work to get the right people in place of leadership, Nigeria has suffered a lot of poor leadership at all levels. “Let us eschew sentiment and other selfish considerations in deciding those who will be our leaders. “We pray that the election will be peaceful, free, fair and acceptable. If the process is fair and just, it will be acceptable to all. “The election will be the greatest challenge to the nation’s democracy; for Catholics if you engage in vote buying, ‘go to confession,’ because you have betrayed your conscience. “Just vote for the right people and your needs will be attended to,” he said. The Catholic prelate described security situation in Nigeria as a cause for concern and urged the Federal Government to address it. Bishop Ezeokafor who linked the number of bad leaders in the country to vote buying, noted that leadership had been the biggest challenge of the country, but could be overcome if the people do the right thing for right leaders to emerge to lead the country. 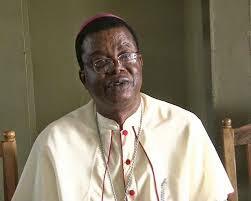 Speaking on the minimum wage saga, the Roman Catholic Bishop of Awka regretted the cost implications of running government, and called for slashing of the jumbo packages earned by legislators and the security votes of the executives as a way of mopping up money to address workers’ demand. He charged Christians to use Christmas which is a significant celebration in the Christendom to pursue the spiritual aspect of the event by being sincere in their endeavours. He lauded the media and urged it to continue to do its job truthfully and with fear of God, so that through information, Nigeria can be more united. The bishop said the coming of Jesus Christ was to reconcile humanity with God, adding that Christmas is the period for all to seek genuine reconciliation with one another for a better society. “I call on journalists to endevour to give people the right information, because the society depends on you to form opinion. There are risks involved, just like other works in life, but do the best you can. “The Christ we celebrate came to reconcile humanity with God; we need a lot of efforts to be reconciled with one another. “We must reconcile truly as individuals and groups; Christians and Muslims, and even pagans, we are all children of one God. We must try and understand our differences. “We must work and keep this country one,” he said. Bishop Ezeokafor urged Nigerians to eschew selfish considerations and electoral corruption while making their voting decisions next year even as he described vote buying as a major challenge to Nigeria’s democracy and urged the electorate to flee from it. “Insecurity is everywhere in the world, but in Nigeria it is not the best; from Boko Haram to herdsmen/farmers clash and high profile murders. “Government must address the insecurity of life and property of Nigerians, I call on them to increase their effort in ensuring a safer Nigeria,” he said. Bishop Ezeokafor advised people to be modest in their spending during the yuletide, so as not to run into debts or become unable to meet January demands. He also called on governments at all levels to cut down their expenditure and pay the N30,000 minimum wage as demanded by workers. “Don’t spend ostentatiously during Christmas or in anticipation of money that has not come. “Plan your household economy so that you can meet the normal needs of the family after the season. “God has given Nigeria the best of human and natural resources that can make it one of the best countries in the world,” he said. Bishop Ezeokafor said government should take care of the working population, adding that N30,000 minimum wage is not impracticable. “While government has a part in the blame, the workers should be worried about how much the government is running itself. “Government can pay if it prunes down the cost of maintaining the various arms of government, ranging from the executive to the legislature. “Corruption is also taking huge wage,” he said.